Black and white and cute all over. 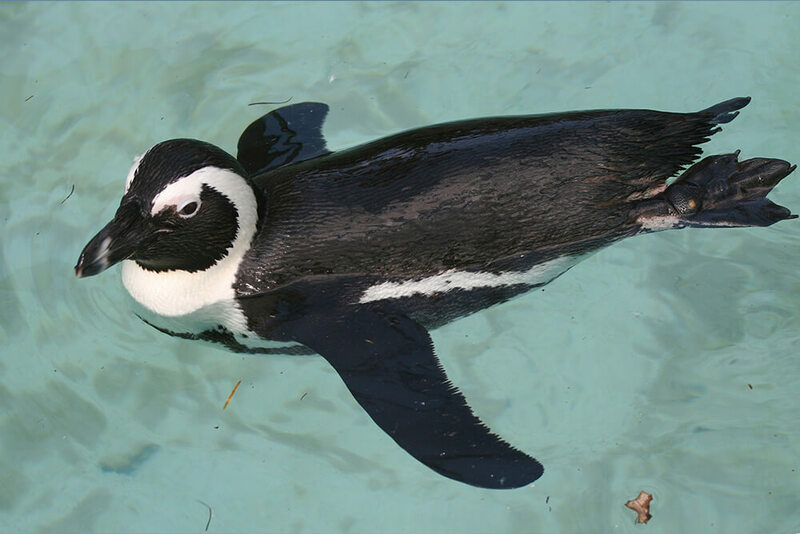 While the African penguin may not be found in freezing temperatures, they are covered in an array of black, white, and gray dense, waterproof feathers that keep them dry and warm in the cold waters off the African coast. They also have a number of dot-like markings flecked across their white chests. These flecks help to individualize each penguin, as each penguin's feather pattern is as individual as a human's fingerprints. The animal has a distinct, sharply pointed beak and black feet. The African penguin is one of the smallest species. Males are generally slightly larger than their female counterparts. African penguins are also widely known as "jackass" penguins, for their donkey-like bray. 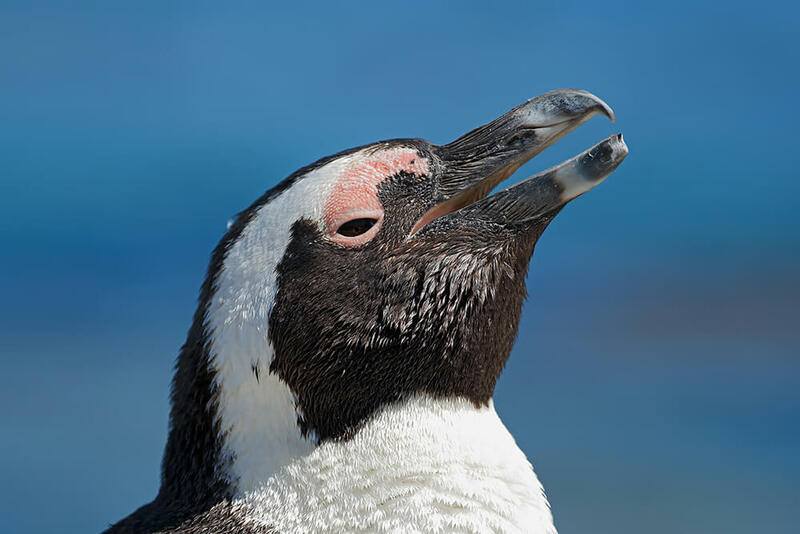 African penguins communicate with one another through vocalizations and body language. Each individual has its own unique vocalization that distinguishes it from the others. They use three different types of calls: a bray, used to attract a mate; the yell, used to defend their territory; and the haw, used by mates to locate each other when one is on land and one is at sea. When a penguin is feeling aggressive, it communicates through body language. It puffs out its chest, holds its wings back, its beak forward, and bobs its head side to side. One of its most distinctive features is a small pink gland above each eye, which helps them cope with high temperatures in South Africa. The hotter the penguin gets, the more blood is sent to these glands where it is cooled by the surrounding air, and keeps the animal cooler. The glands have a pinker appearance the hotter it gets. African penguins can be found in large colonies along the southwestern rocky coast of Africa from Namibia to Port Elizabeth, and many of the surrounding islands. African penguins can be found in large colonies along the southwestern rocky coast of Africa from Namibia to Port Elizabeth, and many of the surrounding islands. The largest colony is located on Dyer Island. The birds build nests out of their own excrement, called guano, under bushes or rocks. This shelter provides them protection from the harsh sun during the hot African days. Being fast swimmers allows them to catch a variety of prey from the sea, including sardines and anchovies, as well as squid and crustaceans. These hearty little penguins can hold their breath over 2 minutes and dive over 400 feet deep! A penguin may eat up to 1 pound of food or 14 percent of its body weight per day. At the Zoo, our penguins enjoy sardines, capelin, and night smelt. They swallow their fish whole and prefer to be hand fed! 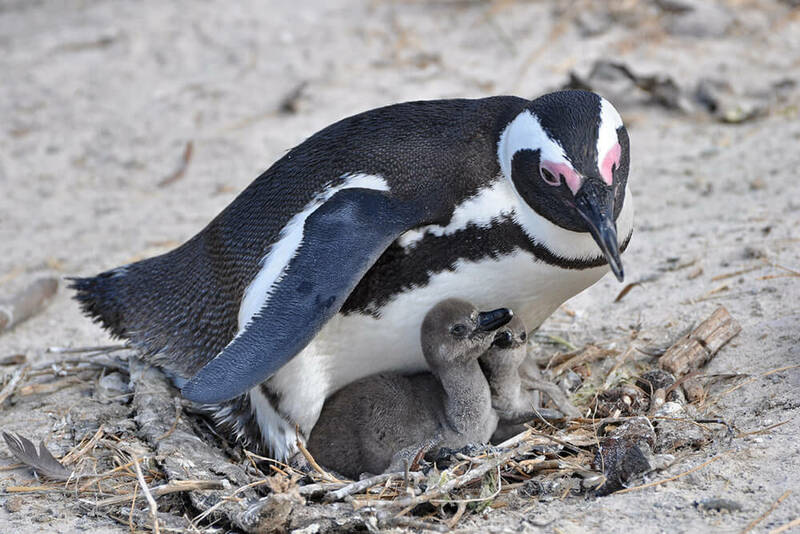 African penguins reach sexual maturity around four years of age. At this time, the male will court the female with a donkey-like bray. Who can resist? (This call also earned them the nickname jackass penguin.) Once the male is accepted by the female, the pair will continue to bond for the rest of the season—and they sometimes remain bonded for future mating seasons, but not always. The female digs a burrow under a bush or a rock where she lays two eggs. Both parents take turns incubating the eggs for up to 40 days. Once the chicks hatch, the parents share the responsibility of keeping the chicks warm and fed constantly for the first 30 days. Once they reach a month old, the chicks are left for short periods with other chicks while their parents hunt for food. The chicks huddle together in large "nursery groups" to keep warm and help protect each other from predators. The juveniles leave the colony when they are around four months of age and have developed their juvenile plumage. Our flock of African penguins can be seen in the big, new Dan and Vi McKinney Penguin Habitat at Cape Fynbos in the San Diego Zoo's Conrad Prebys Africa Rocks. The spacious Penguin Beach features a cobblestone beach, nesting areas, and rockwork that mimics the granite boulders found at Boulders Beach in South Africa—along with a 200,000-gallon pool with depths up to 13 feet, and underwater viewing. Cape Fynbos was the first Africa Rocks habitat to open to the public—on July 1, 2017. As one of the most endangered types of penguin, these little birds need your help! Their numbers have declined by 60 percent in the last 28 years. The African penguins at the Zoo are just the beginning of a large flock that we hope to have over the next couple of years, and start breeding this species. It is important for people to learn about this endearing species. African penguins are believed to be one of the first penguin species to be discovered by humans. These hardy little penguins can hold their breath over 2 minutes and dive over 400 feet deep!